Outside My Window… it’s cool and grey. A holiday Monday here in Canada, it’s still quiet and calm, with dog-walkers and coffee purchasers striding purposefully through our neighborhood. I am thinking…about all the new visitors I had here at Domestic Bliss this week, particularly family members who stopped by to read my thoughts about my Mother-In-Law. I am thankful for…having Alex home this weekend. From the kitchen...we have lots of leftovers from our Thanksgiving dinner yesterday. I will thaw some of my frozen brown bananas to make a couple of loaves today, one to send back with Alex. I am wearing… a nightgown, robe, and slippers. And it’s after 10 am! Don’t tell Flylady. I am going…to finish up Alex’s laundry today, do some baking, declutter my bedroom, and pick up my brother at the airport this evening. I am reading… Lost in the Meritocracy: The Overeducation of an Underachiever. I am hoping… that Alex’s cough is just a cough. I am hearing…Z flipping through he newspaper. Around the house…we definitely need to deal with the garden, as we had our first frost last night. Our maple is just starting to turn, so we’ll have a dump of leaves in the next week or so. I also need to wash the insides of the windows as we had the outsides cleaned a week ago. One of my favorite things...is snuggling in bed with a good book. A Few Plans For The Rest Of The Week: My brother arrives today for his third 10-day period in Toronto before his big move north next month. Tomorrow I take Wilson to the vet for his shots and Michael has his stitch removed. On Wednesday, Michael has a tuba lesson in the evening and Linden MacIntyre is reading at our local library, so Z and I will have to arm-wrestle as to who does what! Next Sunday we go to see Madama Butterfly, our first opera! 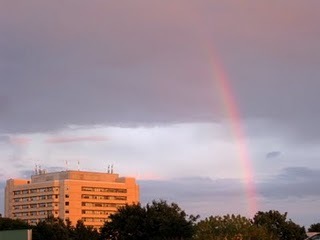 Here is picture thought I am sharing… A rainbow adds beauty to even the bleakest landscape.